Hospital digital donor wall created for organ transplant center. 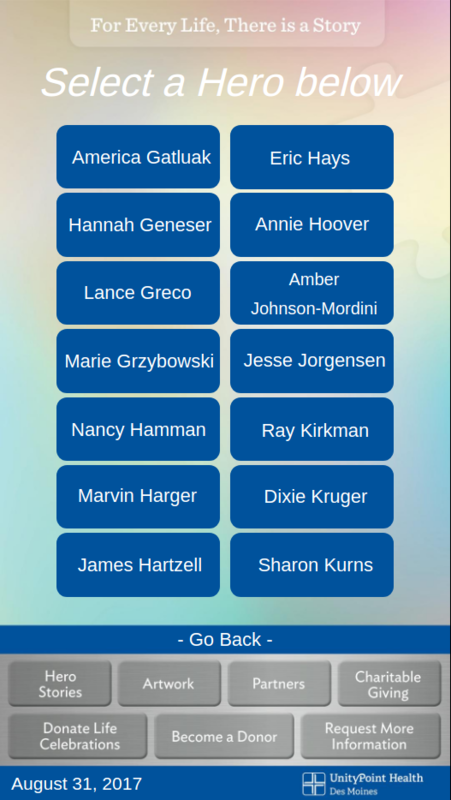 Telling the story of both living and deceased donors in a easy to update digital display. UnityPoint – Iowa Methodist Hospital was looking for a way to celebrate the lives of organ, eye and tissue donors. They had been hanging poster boards with photos and stories, but those just got tattered on the walls and had to be recreated. Keeping track of all of the information on hardcopies became cumbersome as more and more people saved lives through the donor program at UnityPoint – Iowa Methodist. They wanted an attractive display that could be easily updated by staff members, and was interactive enough to draw people’s attention. Other UnityPoint hospitals that Iowa Methodist is a part of had are using Arreya Digital Signage Suite, and thought it would work well for the project at Iowa Methodist. According to Cristina Nelson, Marketing and Public Relations for the hospital, there were no other digital signage companies considered, because of the ease-of-use that marketing departments from other hospitals had experienced. Cristina had never done graphics or layout and design, aside from the occasional Microsoft Word project. Within the Arreya Creative Studio, she created a beautiful interactive donor recognition display that tells the stories of those who have left a legacy by saving others. The Arreya digital signage display is surrounded by a physical donor wall designed and fabricated by a third party. In the beginning, she and some team members had a tutorial session and it was a little overwhelming. After a second one-on-one session screensharing with Arreya tech, Josh Steinke, she was feeling more confident. Cristina feels that she would have been better prepared for the training session if she would have taken advantage of the FREE 30-day trial. “Josh was my Godsend. Every time I had a question or had a problem, he would walk me through it, or just make a change that fixed it.” She loaded 60-70 donor story pages into Arreya, and then they needed a back button at the last minute. Josh helped her get it done in time for her opening. Arreya was implemented in the Iowa Methodist Hospital located in downtown Des Moines, IA on a 42-acre campus. The hospital employs nearly 4,000 people and has 370 staffed beds. Among its services is a state-of-the-art kidney donation and transplant program. UnityPoint – Iowa Methodist Hospital, located in downtown Des Moines, Iowa was looking for a better way to share donor stories from their transplant program. By implementing Arreya Digital Signage Suite, they are able to remotely deploy and update donor stories directly to their 55” monitor. The hospital’s marketing and public relations professional, Cristina Nelson, used Arreya’s built in editor to create all the content on-time to meet their hard deadline for unveiling the transformation display. Use the FREE 30 Day Subscription and do the tutorials before your display has a deadline. Find out what the software can do, and how to do it. “Once you get familiar with it, using Arreya is really easy.” Cristina Nelson, UnityPoint Healthcare marketing department. If you have questions about Arreya, contact us at 319-294-6671, or sign up for a FREE 30 Day Subscription and try it out.